Quite why bad weather forecasts are generally more accurate than good weather forecasts, I don’t know. They are, though. As predicted, today dawned rainy and solidly overcast. We tromped off to Christchurch in search of a McDonalds McWiFi. Could we make the McWiFi work? No! We continued on to Christchurch town centre, which is a challenge to find in itself if you follow the signs or, indeed, if you use an OS map wich insists on marking “Christchurch” some way away from the town centre. Curious! We did eventually find it along with a Costa Coffee advertising free wi-fi. Could we make the Costa wi-fi work? No! Even trying two laptops we couldn’t get it to fly. Francine has bought some knitting with her. Our neighbours are about to become grandparents and Francine is knitting a little je ne sais quoi for the imminent infant. Apparently she needs some things called “stitch holders”. Every time we have visited a town/village in The New Forest, Francine has wandered off in search of a knitting shop for stitch holders, thus far with a complete lack of success. Hopes rose briefly in Lymington where we spotted a haberdashery shop front; the sign in the darkened window said “For Let”. Clearly the well-shod sea-faring folk of Lymington do not mess about making their own clothing, they buy designer gear instead. I can just imagine a Gucci sou’wester – now there’s a thought. Anyway, my apparent sudden change of tack (get the boating reference?) in the storyline is because there, in glorious Christchurch amongst all the broken (i.e. we couldn’t get it to work) wi-fi, was a knitting shop stacked from floor to ceiling with wool. It was also stacked from floor to ceiling with delightful old ladies buying the wool. At last Francine found herself some infant-sized stitch holders. Now, perhaps, we could get on with a bit of traditional tourism. Eventually, as forecast, in the later afternoon the rain eased off and some sun appeared. 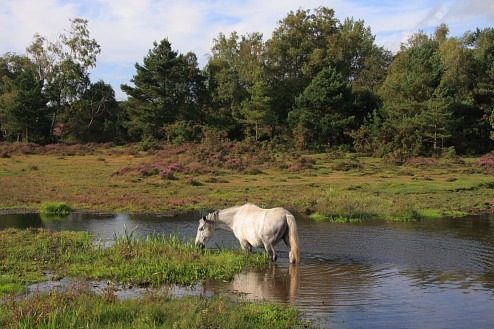 Since no trip to The New Forest would be complete without the famous New Forest ponies, we walked out in search of some. They are not hard to find. Rather, they are difficult to avoid. They know that they own the place and tend to wander along and across roads holding up traffic with complete impunity, even in the middle of towns. A few days ago we watched one unconcerned pony, followed by a line of cars, amble up to the T-junction in the centre of Brockenhurst, turn left (without indicating) and continue leading its patient cortège as it maintained its course up the centre of the road. Excellent! Hence, some of the ponies have reflective collars for safer wandering in the dark. The ponies are wonderful. We soon found some doing what ponies do best, munching grass and looking attractive. One even made a more-interesting-than-usual pony photo by wading into water to eat. The pony’s late afternoon snack was growing in a likely looking marshy habitat that dragonflies should like near Hincheslea Wood. Since it was about 4:00 PM after a particularly drab day, I had little expectation of luck. How wrong I was. 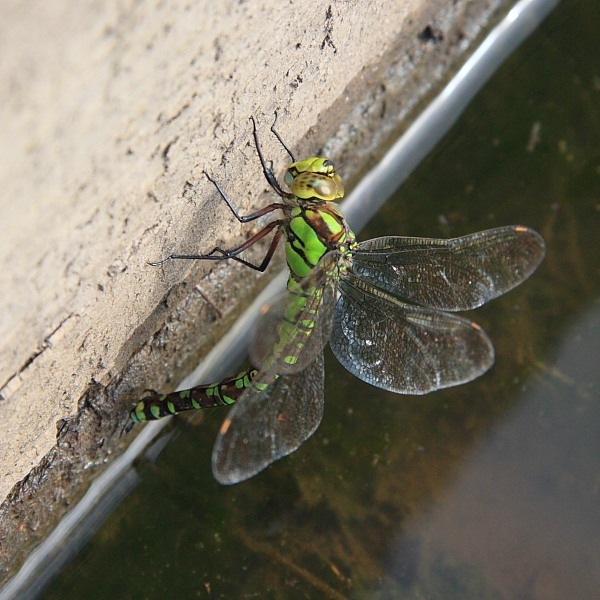 There, zooming about and occasionally pausing to oviposit, was a female Southern Hawker (Aeshna cyanea). Yes, I know, if it was ovipositing, of course it was a female. Duh! I had my camera for snapping ponies but I didn’t have my big lens for snapping dragonflies. Though she wasn’t positioning herself to any great advantage, I did get close enough with a regular lens for some shots of a new critter for my catalogue. A surprisingly fine end to an otherwise dull day.